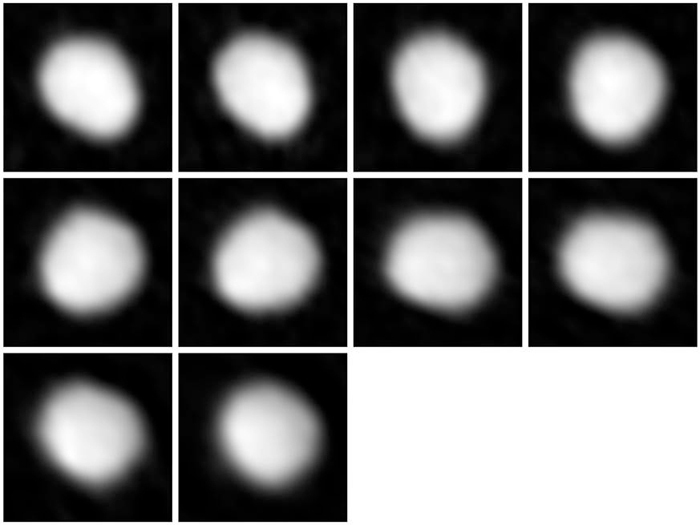 Series of images of the asteroid Juno taken with ALMA as part of the telescope's Long Baseline Campaign. Image courtesy ALMA (NRAO/ESO/NAOJ). A series of images made with the Atacama Large Millimeter/submillimeter Array (ALMA) provides an unprecedented view of the surface of Juno, one of the largest members of our solar system's main asteroid belt. Linked together into a brief animation, these high-resolution images show the asteroid rotating through space as it shines in millimeter-wavelength light. "In contrast to optical telescopes, which capture the reflected light from the Sun, the new ALMA images show the actual millimeter-wavelength light emitted by the asteroid," said Todd Hunter, an astronomer with the National Radio Astronomy Observatory (NRAO) in Charlottesville, Va. A paper prepared by representatives of the entire international ALMA consortium detailing these observations was accepted for publication in the Astrophysical Journal, Letters. According to Hunter: "By using ALMA to image the thermal glow from asteroids like Juno and other bodies in our solar system, astronomers will be able to study their shape, composition, and surface properties." The complete ALMA observation, which includes 10 separate images, documents about 60 percent of one rotation of the asteroid. It was conducted over the course of four hours on 19 October 2014 when Juno was approximately 295 million kilometers from Earth. In these images, the asteroid's axis of rotation is tilted away from the Earth, revealing its southern hemisphere most prominently. For this observation, ALMA achieved a resolution of 40 milliarcseconds, meaning that each "pixel" in the images is about 60 kilometers across, covering approximately one fourth of the surface of Juno. This resolution is a vast improvement over earlier observations made at similar wavelengths and is enough to clearly resolve the shape of the asteroid and potentially tease out prominent surface features. Juno will make its next close approach to Earth in November 2018. Since the asteroid will be much closer than it was in the most recent observations, ALMA will be able to double its resolution, potentially revealing new details about this intriguing object. At approximately 240 kilometers across, Juno is among the largest members of the solar system's main asteroid belt, but it is still only a few percent the mass of this region's largest inhabitant: the dwarf planet Ceres, which is now playing host to NASA's Dawn spacecraft. "This new observation clearly demonstrates that ALMA will be a very powerful tool for studying asteroids," said NRAO astronomer Arielle Moullet. "At its highest resolution, ALMA is powerful enough to resolve the surface of many asteroids." Earlier models of Juno developed by studying its reflected light indicate that it has an oblong, or potato-like, shape with possibly minor indentations on its surface. The ALMA images seem to support this model. Juno is one of five targets selected for study during the ALMA Long Baseline Campaign to test the telescope's high-resolution capabilities, achieved when the antennas are at their greatest separation: up to 15 kilometers apart. The other targets include the protoplanetary disk HL Tau, the gravitationally lensed galaxy SDP.81, the star Mira, and quasar 3C138.